The roots of this collaboration run deep and wide! This team came together with allies across the city to make something beautiful happen for their community. Neighborhood Allies is proud to be a supporter, partner and ally of this project in Larimer! The Pgh Mobile Toolbox Rolls to Larimer for It’s First Job! 25 resident-led projects, nine neighborhoods, over $47,000 of direct investment into communities! Betty said ownership for community members is key. On paper, their partnership doesn’t have obvious roots. Betty is a black woman who grew up in the Hill District. She moved to Larimer in 1970 to raise her kids. She still lives in the same house within sight of the healing garden. Ben is a 36-year-old white man, son of a law professor father and urban planner mother who attended the same elite boarding school they did. He studied design at Carnegie Mellon University and later pursued whitewater kayaking and cabinetry in West Virginia. Betty is the unofficial mayor of Larimer, with local politicians on speed dial. She once labored as a laundry presser in Presbyterian Hospital before studying writing and social work at the University of Pittsburgh. She went on to serve as a manager at the Women’s Center and Shelter of Greater Pittsburgh. Ben now co-owns Fourth River Workers Guild, a construction and landscape business. 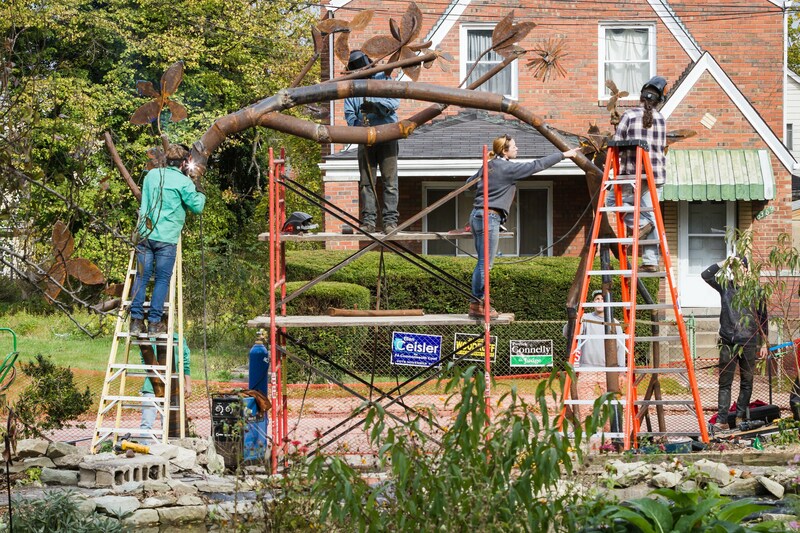 Several years ago, a permaculture class at Phipps Conservatory piqued his interest for its integration of ecology and sociology. Ben shared Betty’s frustration with the city’s slow-moving bureaucracy around illegal dumping. 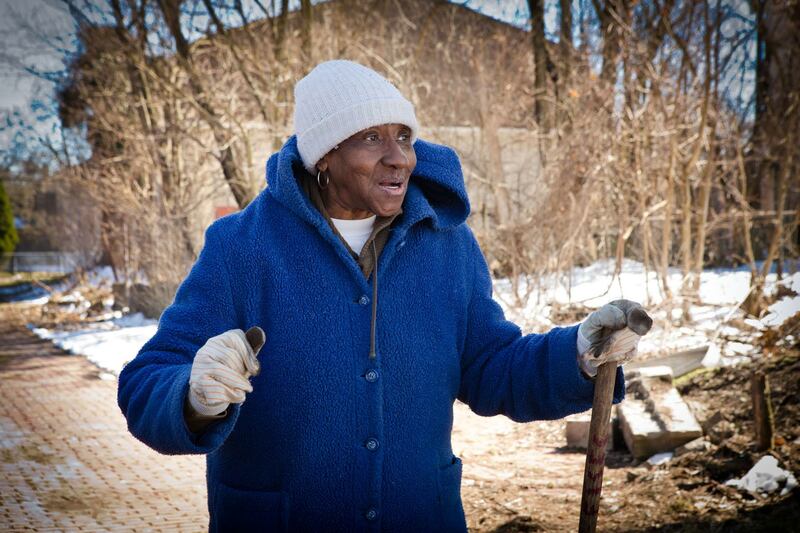 When he proposed Fifty-Two Lots, a program to visit and clean up one vacant lot a week, he got Betty’s attention. “She has this sort of head gesture . . . and I look at Betty and I could just tell Betty got it,” he said. “So I called him,” Betty recalled, “and I said, ‘Maybe we need to hook up because I’m doing the Redd-Up stuff and you’re doing Fifty-Two Lots. Maybe we need to do it together.’” And they did. The physical act of cleaning, Ben explained, defused some of the politics and built trust. As they labored, people listened to each other about what they wanted to see in Larimer. “If people have rakes and shovels in their hands, you just talk, right? You don’t, you’re not going to be out there shoveling for an hour, you know, mowing and raking and cutting grass, and get confrontational with somebody,” Ben said. 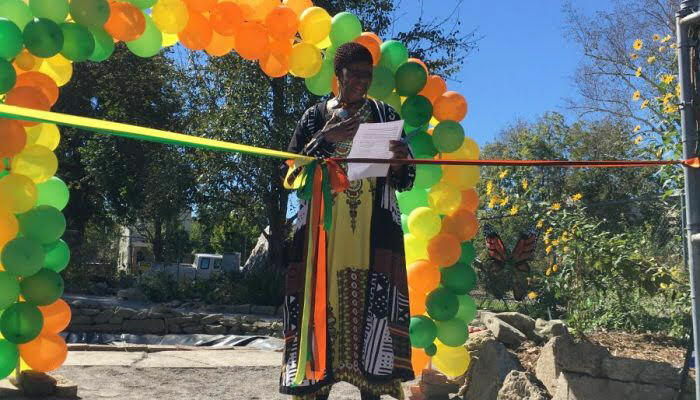 That dialogue led to the African Healing Garden. Before her death, Betty’s mentor and longtime Larimer activist Ora Lee Carroll had planted herbs and pear trees in an abandoned lot on Meadow Street that Betty owned. 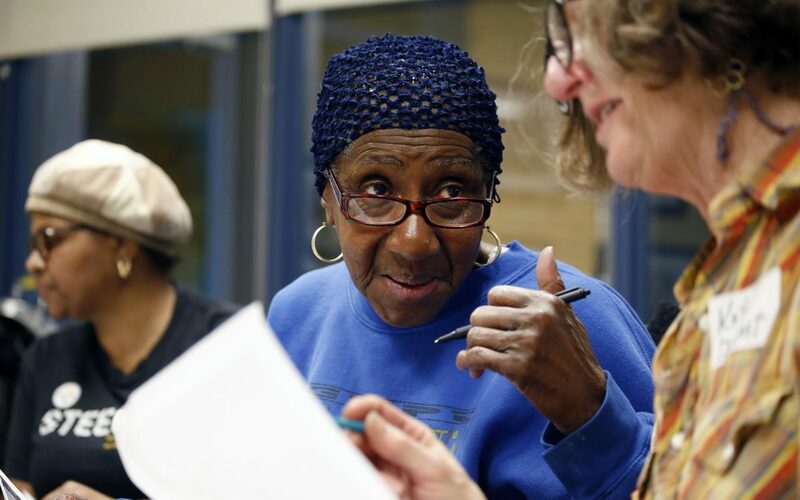 Carroll’s vision for Larimer had inspired both Betty’s leadership and the Larimer Consensus Group, a local stakeholders’ organization partnering with Pittsburgh’s municipal entities to address socioeconomic growth. When the Fifty-Two Lots project became harder to coordinate, she told Ben about that lot and those pear trees that remind her of Carroll. Betty imagined it as a garden where folks could gather, slow down, find peace. “I needed a healing,” she said. She was hurting from Carroll’s death and hurting even more so from the violence, from once watching a boy bleed to death on Meadow Street after he was gunned down by gangs. Larimer received a $30 million Choice Neighborhoods grant from U.S. Housing and Urban Development [HUD] in June 2014. The grant’s purpose was to invest in not only buildings but quality-of-life improvements. For Larimer, this included 334 mixed-income homes, an urban park and commercial space. 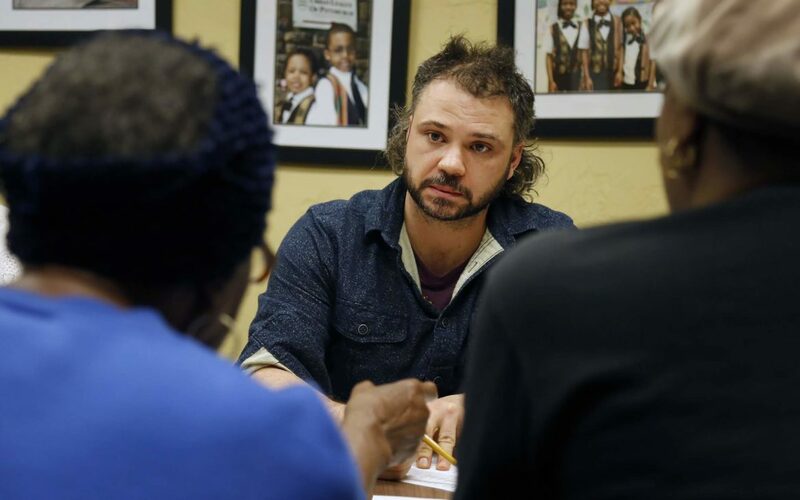 Betty and Ben saw the HUD grant’s potential for positive change. But they also had questions. How could this money help the people already living in Larimer? 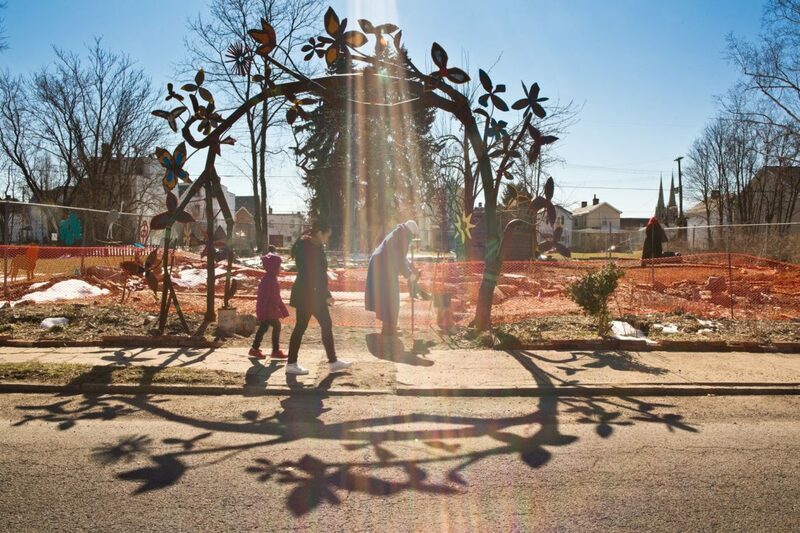 They envisioned the healing garden as, in Ben’s words, a “counter-argument to the systematic methods of economic development at the expense” of folks like Betty who have deep roots there but might get pushed out to feed a growing tax base. In 2016, Betty called Mark D’Amico, manager of Studio Phipps at the conservatory, to ask him to help design the garden. “It was pretty much all Betty, and her inspiration was contagious,” D’Amico recalled. 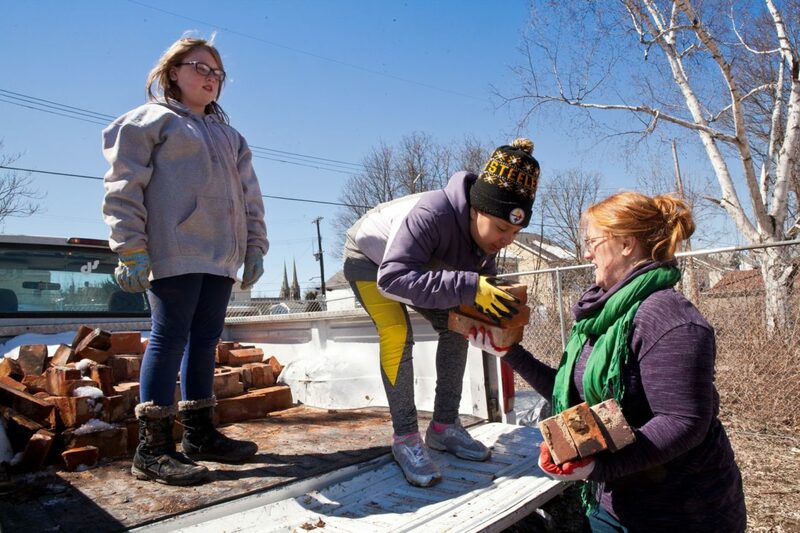 As volunteers began digging around the foundation of a house that burned down on the lot, Betty also began laying the foundation to carry on Carroll’s activism. She started Larimer Community Watchers, a group empowering residents to make their voices heard by city planners. At these meetings, she also spread word about the garden. Originally, the Choice Neighborhoods plan required homeowners to take out loans for renovations, rather than apply for grant funding. 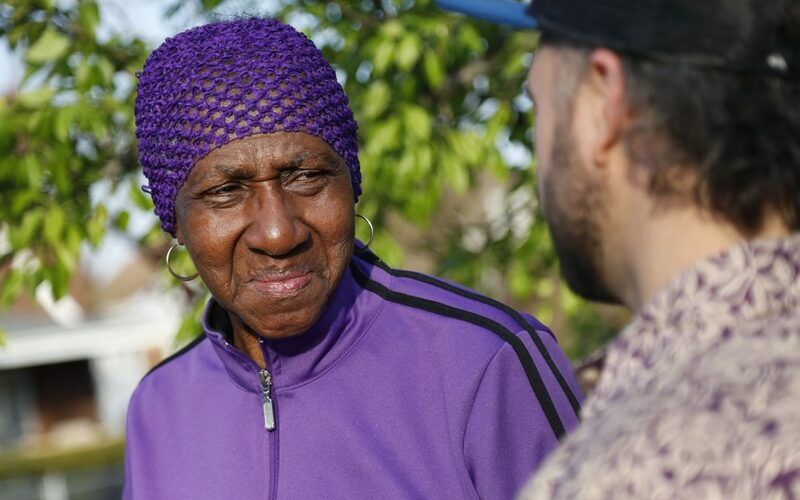 When Betty reached out to the city to fight this requirement and get more financial support, members of her community told her, “‘They ain’t gonna let you do that.’” She was undeterred. How can a community hold the reins while also opening its hands to receive resources from outsiders? “Me and him have this relationship. It’s not about race to me,” she said. This past fall, the garden—and neighborhood—sprang to life. Students from Winchester Thurston School painted African symbols and animals carved out of wood. One Saturday in September, parents at nearby Mount Ararat Baptist Church brought their kids over from Bible school to read the symbols’ laminated descriptions and to talk to Ben. Larimer resident Alexis Howard, active with Larimer Community Watchers, did not know neighbor Jackson well before the garden, but toiling together in all kinds of weather and meeting regularly about homeownership has built trust. Howard recently bought a house down the street from Jackson, and Jackson knows she can call on her if she needs anything. Betty hopes that residents will share in the garden’s ownership. But the garden itself is not yet officially open, with one section of its fencing topped with barbed wire. Some are concerned about theft, drug use and vagrancy. Eng worries that the longer the garden is closed to the public, the less likely they will be to engage in it. Resident Diane Darby said they hope to someday hold open garden hours, like at Phipps. Still, Pittsburgh has already responded. The garden has received more than $20,000 in grants and donations from organizations like the Hillman Foundation*, Neighborhood Allies, Grow Pittsburgh, East Liberty Presbyterian Church, Saint Andrew’s Episcopal Church, state Rep. Ed Gainey’s office and the Urban Academy of Greater Pittsburgh. New Jerusalem Holiness Church, a few blocks away, has given historic iron fencing; one donor helped pay for an adjoining lot. Talks are in progress with the Urban Academy to develop learning opportunities, including a butterfly garden. Ben said they are also “assessing options” about how to conserve it—maybe a land conservancy trust, with residents as the trustees, or perhaps a partnership with other nonprofits, churches or schools. Right now, they’re mostly focused on educating newcomers about the garden’s proper use. When Betty recently saw young boys playing on Carroll’s pear tree, she scolded them not to tear it down. She tried to instill in them a sense of responsibility. “Don’t let nobody else come in here and mess it up,” she said. The children are the focus. Betty imagines kids of different races and ethnicities gathering in the garden, celebrating their culture and learning from each other. Abrams marveled at the longevity of Betty and Ben’s partnership, seeing them as “two souls” who have both “done their healing. Last Oct. 1, days after a local fire chief called the Steelers head coach the N-word, at the hour when the Steelers were taking the field against the Ravens and everyone was wondering whether they would stand or kneel for the national anthem, people of all ages and races gathered a block down from a weed-covered lot dotted with broken TV sets to celebrate the garden’s ribbon-cutting. Larimer resident Tony Mainiero, who is 98, sat next to Betty under a tent and reminisced about when his fellow Italians lived here, 9 to 15 children per family, and Washington Boulevard was a river. Chintalapalli showed up with cases of soda and apologies from the mayor for not being able to attend. Everyone trooped into Meadow Street to watch Betty cut the ribbon. Gainey raised his cell phone to snap a picture of her haloed by balloons, holding her prepared remarks at the garden entrance. “A ghetto is made by the people in it,” she said, standing in her African kente cloth and dark red crocheted cap. She gestured to Ben in the crowd. She admitted that she yelled at him a lot, but she couldn’t do it without him. The people standing in the street and taking pictures seemed invigorated at the prospect of this new community anchor — of a power arising not out of a city hall or a company’s master plan, but out of a neighborhood, up from the ground. This story was fact-checked by Juliette Rihl. Jonathan Callard writes and lives in Pittsburgh. He can be reached at jonathan@jonathancallard.com. *The Heinz Endowments and Hillman Foundation provide funding to PublicSource.